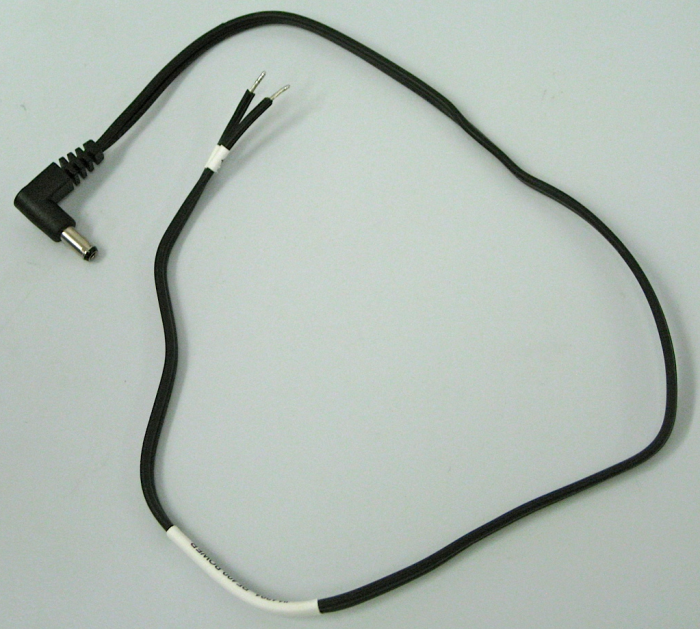 The 14291 power cable terminates in a barrel plug on one end and two pigtails on the other end. The cable is 2 ft long. For some circumstances, the 14291 Field Power Cable is required for the data logger to power a spread-spectrum radio, MD485 Multidrop Modem, or SC532A. The cable's right-angle barrel plug connects to the device, and its two-conductor pigtail connects to the 12V and G terminals of a data logger. The 14291 is required when the device is connected to the data logger's RS-232 port instead of its CS I/O port. It is also required when the device is connected to the CS I/O port of an older data logger. Newer data loggers supply 12 V power on pin 8 of their CS I/O port. Some older data loggers lack 12 V power on pin 8 and therefore require the 14291. The table below indicates whether or not 12 V is supplied on pin 8. Prior to June 23, 2009, the 14291 had a straight barrel connector. The 14291 was redesigned to have a right-angle connector so that the cable would fit better in an enclosure.